Importing videos recorded on a DVD disc to iMovie '08. Connect the AC Adaptor and the power cord (mains lead) to your camcorder and the wall outlet (wall socket). Insert the recorded 8cm DVD disc into your camcorder. 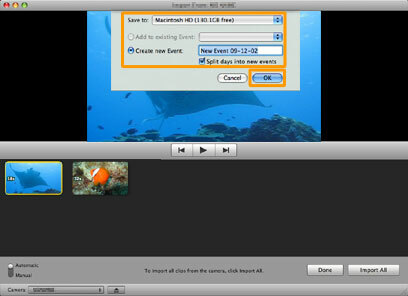 Connect the camcorder to the computer using the supplied USB cable as shown. The USB SELECT screen appears on the camcorder automatically. Select USB CONNECT on the camcorder screen. A DVD icon appears on the computer desktop. Confirm that the camera name is the same as shown in the STEP 1. (2) Click and check the boxes under the videos you want to import. Select the location to save, input an event name in Creat new Event, and click OK. Import of videos starts. When the Import complete message appears, click OK. List of imported videos is shown. This is the end of importing videos. When disconnecting the USB cable, drag the DVD icon to the Trash icon or turn off the computer before disconnecting the USB cable. Functions such as "Easy PC Back-up" or "One Touch Disc Burn" cannot be used with Mac OS. If you cannot import videos, update all the software and OS, and try again. 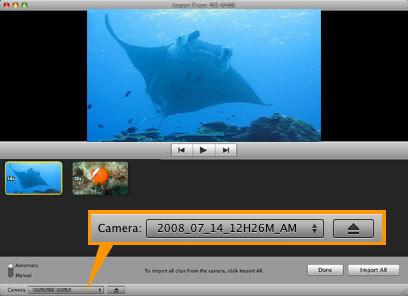 AVCHD and MPEG2 videos are supported by iMovie '08 or later.